Step aside, Donna Karan, Tommy Hilfiger and Marc Jacobs. Mass retailers -- from Macy's to QVC -- are grabbing a piece of the Fashion Week spotlight. On Thursday night, New York City will transform into one big after-hours shopping party for Fashion's Night Out, a whirlwind of festive, quirky store events where shoppers can rub elbows with celebrities and designers, drink, dance, undergo makeovers, and scoop up product giveaways to kick off New York Fashion Week. Although the runway shows where designers will unveil their Spring 2012 collections are the main attraction in the Big Apple this week and next, retailers are increasingly using Fashion's Night Out -- now in its third year -- as a venue to assert their fashion cred not only in New York, but nationwide. "National retailers are using the notoriety and reach [of Fashion Week] to show that they are tuned in to what's cutting edge," Faith Hope Consolo, chairman of the retail leasing, marketing and sales division of Prudential Douglas Elliman Real Estate, tells DailyFinance. "Participating in FNO gives them the platform." "This is fashion for the masses, says Consolo, who is also known as "the queen of retail." "Everyone across the nation and beyond can shop and be part of the movement. We are a country of shopaholics [and] FNO is the biggest and best fashion party of the year." Fashion's Night Out, conceived by iconic Vogue editor in chief Anna Wintour, plays as both a love letter from the fashion industry to itself, and an opportunity for us regular folk to be a part of the in crowd -- even if just for one night. "The simple genius of Anna's idea is that consumers are social creatures, and if everyone else is out shopping, then the logical conclusion is that it must be in vogue -- sorry -- couldn't resist!" Susan Scafidi, professor and academic director of the Fashion Law Institute at Fordham Law School, tells DailyFinance. "Throw in a label magically coming to life in the form of designers' personal appearances, exclusive merchandise, music, and free drinks, and you've got a potent commercial cocktail." Live, From Macy's and QVC, It's Fashion's Night Out! 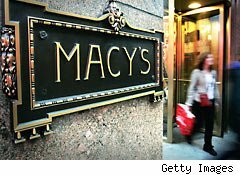 Macy's (M) is bringing its FNO festivities to a national audience for the first time on macys.com by live-streaming the event from the seat of the action at its flagship store in Manhattan's Herald Square. There, shoppers can schmooze with Tommy Hilfiger in the men's department, take in a concert from singer Joss Stone and get makeup tips from Bobbi Brown. Macy's is also holding FNO events at select Macy's stores in Chicago, Miami, Philadelphia and Los Angeles, among other cities. Meanwhile, shopping channel QVC (LINTA) will transform its televised self into a brick-and-mortar merchant on FNO with a "multimedia shopping experience" in New York's Soho neighborhood that it will broadcast live. The party will showcase QVC's latest lines, including Wildlife by Heidi Klum and the Kris Jenner Fashion Kollection. Shoppers can also pick up fashion and beauty tips from QVC designers. ﻿is one retailer that has been burnishing its style cred for years. And for FNO, the nation's only mass merchant couturier has launched a Missoni pop-up store in Midtown Manhattan, featuring its new limited-edition collection from the Italian fashion house, known for its zigzag patterns. The shop features "Little Marina," a 25-foot-tall doll decked out in Missoni knitwear that will be operated by puppeteers. The Missoni for Target apparel and home collection hits stores nationwide this month, adding another high-end name to a long list of exclusive designer partnerships that includes Jean Paul Gaultier, Isaac Mizrahi and Zac Posen. J.C. Penney (JCP) has set out to bring a "fun and light hearted" spirit to its FNO events this year, April Dinwoodie, divisional vice president of brand communications and publicity, tells DailyFinance. The retailer is urging shoppers to bring a fashion "miss" from their closet to its store at the Manhattan Mall and trade it in for a fashion "must." Shoppers will get an early preview of the retailer's "must have" fall apparel and accessories -- items that have been hand-picked by fashion editors at People magazine's StyleWatch. DJ Chachi will spin some tunes, while shoppers are treated to "miss for a must mocktails," and can apply to win J.C. Penney gift cards. Even Stationery chain PAPYRUS is getting into the act. Yes, you heard right. What does stationery have to do with fashion? ﻿"We are excited to present our fashion aesthetic as it relates to paper as a fashion statement," Dominique Schurman, CEO of PAPYRUS's parent company, Schurman Retail Group, tells DailyFinance. "We have partnered with Rami Kashou of Project Runway, the students of Pratt Institute's School of Art and Design in New York, as well as with our own internal design team to develop a gallery of couture gowns made exclusively with stationery, wrapping papers, cards, ribbons and trims from the PAPYRUS stores." The gowns will be worn by models at fashion shows during Fashion Week at PAPYRUS's Orange County, California, store in South Coast Plaza and its Soho store in New York. "These gowns are truly works of art and the capture the amazing, unique quality of how paper can become incredibly fashionable," Schurman says. During Fashion Week,the retailer is also launching NIQUEA.D, its new collection of jewelry, accessories, home décor and high-end greeting cards and stationery. "We will be unveiling 30 boutiques within some of our PAPYRUS stores, a perfect fit for the occasion of FNO," Schurman says.